Yes, I'm praising my own work . Whichever way I look at this quilt I really like it , I'm pleased . If you cannot say that about your own work then hide it away . The book has 8 quilts in and I shall make them all . I like doing applique . The birds will have plenty of cover in my garden this year , everything is pretty lush with all the rain we had . I'm now off to have my lunch . Jacket potato with chilli . Hopefully I will be sewing this afternoon if Pinterest doesn't capture my attention . I have fabric cutting to do as well . I did intend to pop to the town for knitting yarn but a neighbour called so that didn't happen . I seem to have open house , there is always someone dropping in . I never turn anyone away saying sorry I'm going out . I love your quilt from every angle, too...it's glorious! You do such wonderful applique. Your garden is looking fantastic from all the speing rain. Have a wonderful day...! Love your quilt. I believe i have seen that book in the library here in town. Me thinks it needs to be borrowed for a closer look. Nice garden too, mine is looking better now we have had a couple of decent rains during the past week or two. Lovely, bright and fresh quilt,, well done you!!! LOve,love,love your quilt,can't wait to see the rest as you make them up :) Barb. I love that quilt too and all the others on your blog I have just started to sew quilts and have the bug! I love bright colours and have the fabric to start one in Moda Terrain, a Jelly roll with some extra fabric to have good size squares with the smaller ones from the jelly roll. Can't wait to get started! 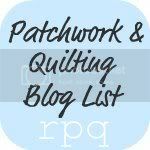 I love applique too... and your quilt is GORGEOUS!!! I'm working on a baby quilt right now using applique too.